NOLOSE board co-chair Galadriel Mozee envisions a world where all bodies are valued. Photo by Alysia Angel. The heart of the fat positivity movement grew another size this year. NOLOSE, an activist organization originally called the National Organization for Lesbians of SizE, has shed an identity-based membership policy in favor of one that has room for everyone who supports the cause. This will be the first year men who don’t identify as transgender are welcome to join their fellow fat activists for NOLOSE 2012: Fat Strikes Back!, Sept. 7-9 in San Francisco. Organizers say the more-or-less annual conference will include DIY workshops, coalition building, skill sharing, pool time, and food. The itinerary may seem like standard conference fodder, but its impact is greater than the sum of its parts. Despite the progress of social justice movements such as LGBTQ equality, people of size still face pervasive discrimination. Daily headlines attempt to link health with size while ads push an ideal body that is uniformly svelte. As a result, people of size may be denied adequate healthcare services and even be turned away completely, according to Mozee. While fat phobia — which, like homophobia, is more complex than simple fear — adds to the burden carried by already oppressed groups, Mozee says its not just fat folks who suffer. 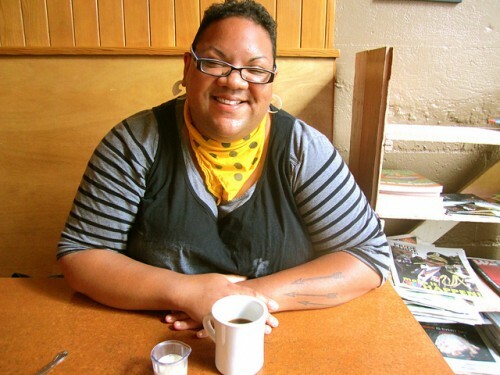 “Fat phobia hurts people of size by telling them they are not of value, there is no place for them and they do not deserve respect, but it also hurts people whose bodies currently fall into society’s acceptable parameters by demonstrating to them that should their bodies stop being acceptable they will lose privilege and power,” Mozee says. In a world not built for people of size, fat activists are accustomed to doing it themselves. In Portland, that DIY spirit infuses fat-friendly businesses such as clothing resale shop Fat Fancy and designers Size Queen Clothing and Diesel Femme Wear & Wares as well as social events, including the size-positive swim party Chunky Dunk and dance night Jelly Roll. Bit by bit, fat activists in Portland are creating space for people of size to live their lives free from shame. To learn more about NOLOSE, visit nolose.org.